90 Hamilton County high school students attended the 2018 PEF Camp College hosted for the 20th year at Sewanee: University of the South. More than 1000 HCS students have now completed the PEF Camp College program. 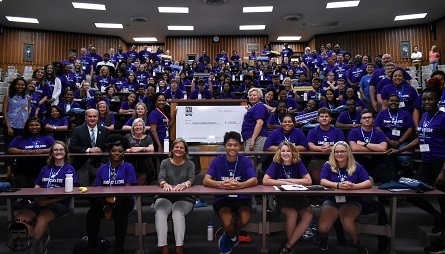 Ninety Hamilton County high school students traveled to Sewanee: The University of the South on Thursday, July 19 for PEF’s Camp College, a three day pre-college workshop that offered intensive, hands-on help navigating the complicated college application process. Students from Brainerd High, Center for Creative Arts, Central High, Chattanooga Girls Leadership Academy, Collegiate High, Chattanooga School for the Arts and Sciences, East Hamilton, East Ridge, Hixson High, Howard School, Ivy Academy, Lookout Valley Middle High, Ooltewah High, Red Bank High, Sale Creek Middle High, Sequoyah High, Soddy Daisy High, STEM School Chattanooga and Tyner Academy attended the 20th year. “Camp College is designed to help first-generation students with all the ins and outs of finding the right college, then applying and paying for it,” says Stacy Lightfoot, PEF vice president of College and Career Success. “It can be a daunting process and we often find that very talented students don’t enroll in college because they just don’t know where to begin or what’s required. Visiting a beautiful campus like Sewanee is an eye-opening experience for many students. We are thrilled that our 1,000th student completed Camp College this year." Sewanee: The University of the South, has hosted Camp College for two decades. The faculty at Camp College included 42 admissions counselors and college advisors from around the country who volunteered their time and expertise to help Hamilton County public school students. Workshop sessions included mock interviews, admissions role playing, essay writing, one-on-one transcript review, understanding financial aid, a college fair and building your own professional brand. Longtime PEF supporter Susan Street was also honored at Camp College. 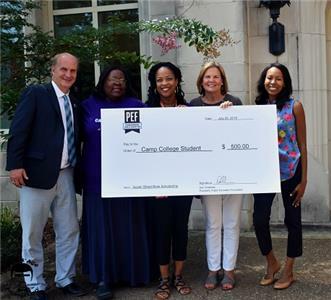 PEF will offer a $500 book scholarship to a 2019 Camp College graduate in her name. Ms. Street's vision helped PEF create Camp College two decades ago, officials said. Ninety-five percent of Camp College graduates enroll in college and 65 percent complete a degree within six years, which well exceeds the national average of 26 percent for students from low-income backgrounds across the country, officials said. Camp College is part of PEF’s College and Career Success initiative, which strives to increase the number of Hamilton County Schools students who enroll in and complete post-secondary education. Funding for Camp College is provided by Sewanee: The University of the South, Chegg, NACAC, SACAC, UBS Financial Services and various individual donors. PEF President Dr. Dan Challener, along with PEF's Janice Neal, Stacy Lightfoot and Donyel Scruggs, honor one of our PEF Camp College founders, Susan Street, with a $500 book scholarship in her name. The scholarship will be awarded to a 2019 Hamilton County high school student who participates in Camp College.